Perched high on the volcanic island of Santorini in the midst of the most famous traditional village of Oia (Ia) stands the legendary Castle of Oia. Once used as a fortress, it is now the most popular destination for romance and lovers. The passion for this magical place lures everyone to the breathtaking view of the world's most famous sunset. 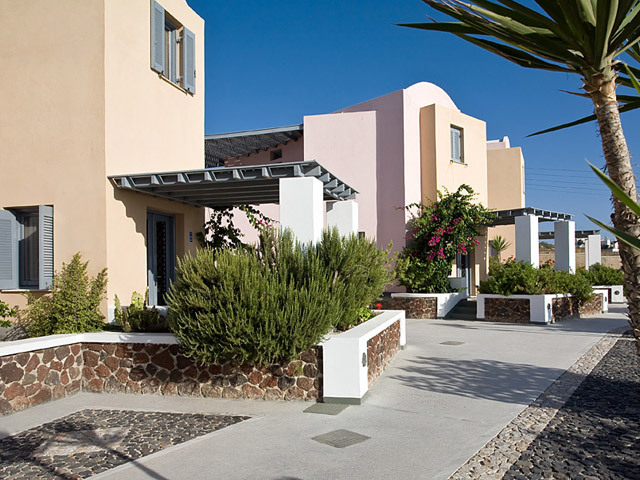 Oia Castle Boutique Hotel & Suites is located on the old Castle at the same traditional building where the famous movie Summer Lovers was filmed. Its Suites and Villas were recreated from the romantic past and combined with every modern day luxury at the most attractive spot of Oia. Each lavish detail will delight you as you soak up the Caldera views, the Aegean sea and the dreamlike traditional village, from your own private viewing platform at the world's most romantic sunset! 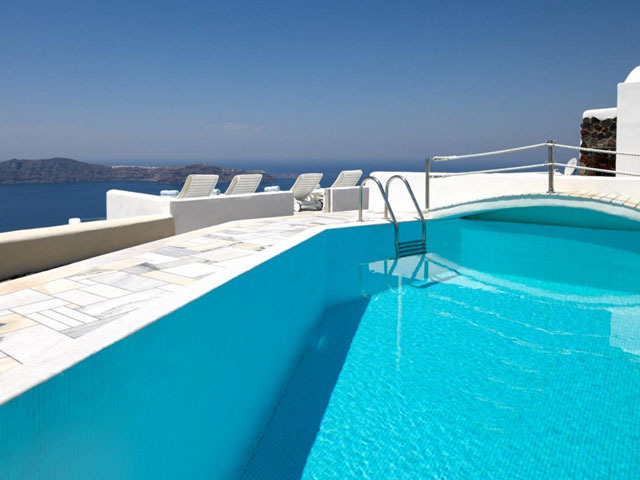 The romantic setting of Oia with its unparalleled Caldera view, combined with luxury accommodations offered by this exquisite boutique hotel in Santorini, Oia, makes the Oia Castle Luxury Suites the ideal honeymoon choice. The sublime Caldera view, the timeless beauty of Oia village and the intimate honeymoon suites are a wonderful marriage of creativity and luxury sure to make your dreams come true. The suites provide a captivating view of one of the most famous sunsets in the world, sinking in the sea, promising a spectacular show of colour flowing from nature’s paint brush. Oia Castle Hotel is located on the Castle at the same traditional building where the famous movie "Summer Lovers" was filmed. The Suites and Villas were recreated from the romantic past and combined with every modern-day luxury in the most attractive area of Oia offering a Direct sunset view. Each lavish detail will delight you as you soak up the Caldera view, the Aegean Sea and the dreamlike traditional village, from your own private viewing platform for the world's most romantic sunset! The Sunset Honeymoon Suite was especially conceived with the most romantic time of your life in mind, your honeymoon. Delight in the majestic view while you soak in your outdoor Jacuzzi or relax in your indoor hamam with aromatherapy, as the passionate ambience of Santorini carries you away. The Suite is beautifully designed with a sumptuously-decorated living room leading into an elegant bedroom with queen-size bed. There is a generous veranda with comfortable sun-beds. Discover a new level of luxury in the sublime Aqua Suite. Pamper yourself in every possible way as you enjoy the luxury amenities offered in this unique deluxe suite. The indoor heated cave swimming pool will delight you as you dive into its fantasy world. The cosy private balcony will capture your heart as you dream away with the sunset. The Aqua Deluxe Suite is beautifully decorated with a spacious living & dining room, a comfortable bedroom with queen-size bed and a French-style bathtub in the bathroom. As a special feature it can be combined with the Marine Suite, creating a spacious villa fit for a royal family. The Marine Superior Suite is a superb example of Cycladic design with painstaking attention to detail that creates a sublime setting for well-deserved pampering. The outdoor heated Spa with hydro/air massage set in its own mini-cave overlooks the romantic sunset of Santorini, creating a mythical ambience that will satisfy even the most discerning guest. The Marine Superior Suite is beautifully decorated with a spacious living room and a lovely bedroom with a queen size bed, and it can be combined with Aqua Suite to create a very spacious two-suite Villa. Elegance from times gone by, memories of ancient life styles, black and red stones intertwine with white sculptural walls beckoning guests to dream away. This is the magical atmosphere of our Volcano villa. Relax in your lounge chair and enjoy the sunset from your own courtyard. Volcano is truly an experience that is bound to excite all your senses. The Volcano Junior Villa is beautifully decorated with a spacious living room, bedroom with a queen size bed, a hydro-massage bathtub in the bathroom, and a private outdoor heated Jacuzzi. 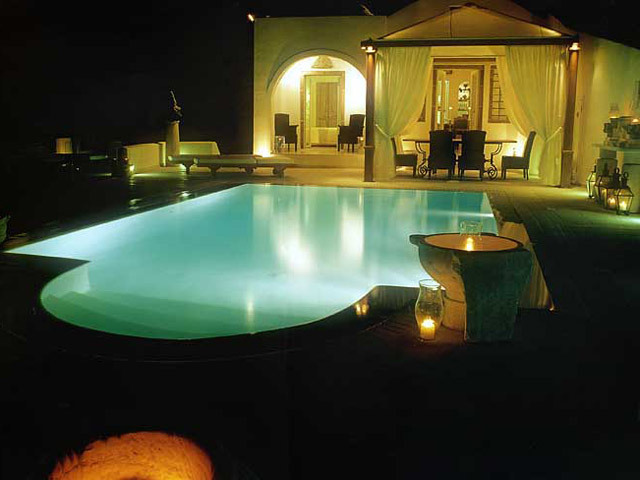 From the moment one enters the Olympic Deluxe Villa, feelings of grandeur and magic overwhelm the senses. The chic design, the never-ending game of shadow and light, the memories of Ancient Greece and the white and gold details spread around this glorious space create an artistic combination of modern luxury and ancient simplicity. Feel like a Greek God as you discover a new concept for vacationing while luxuriating in your own heated indoor cave swimming pool with hydro-massage and chromatotherapy. The Olympic Deluxe Villa is richly decorated with a luxurious living room and fully equipped kitchen, a spacious, inviting bedroom with king-size bed and a large hydro-massage bathtub in the bathroom. There is a second bedroom with double bed and en-suite shower. This very intimate exclusive Honeymoon Villa invites you to revisit the myth of Eros, the Greek God of love. Indulge your passions and embrace the exquisite beauty of your surroundings inspired by the myth. The warm tones of the sculptured walls, the beautiful marble and wood designs will enchant you. Your own spacious hamam with chromatotherapy awaits to indulge your senses when the mood is just right. Let the last colors of the sun dance their way into your private indoor/outdoor heated cave swimming pool. Enjoy the spectacular sunset of Oia and let Eros target your hearts forever!